This station drill uses a half of one zone. It is ideal to have one net, a goalie, and either two cones or tires. The focus of the station is control turns, passing and receiving, and shot release. Set up the drill with two cones about 8 feet inside the blue line lined up slightly outside the posts. The line starts at the blue line directly in line with the dots as shown. The coach can set up right on the face off dot. The first player starts the drill by making a pass to the coach and skating around either cone. Right after they come out of the turn the coach makes a pass back to the player. The player makes an accurate one-time pass right back to the coach and then skates around the other cone. Again, right after they come around the cone they receive a pass back from the coach. 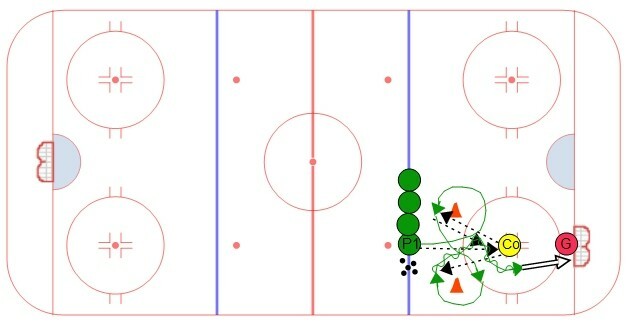 This time the players have to receive the pass and make a move on the coach, quickly followed by a shot on net. The shot should come right after the move and not walk in on the goalie. The objective is to make a move right after receiving the pass, get the goaltender to move lateral and take the shot.